The QDockArea class manages and lays out QDockWindows. A QDockArea is a container which manages a list of QDockWindows which it lays out within its area. In cooperation with the QDockWindows it is responsible for the docking and undocking of QDockWindows and moving them inside the dock area. QDockAreas also handle the wrapping of QDockWindows to fill the available space as compactly as possible. QDockAreas can contain QToolBars since QToolBar is a QDockWindow subclass. QMainWindow contains four QDockAreas which you can use for your QToolBars and QDockWindows, so in most situations you do not need to use the QDockArea class directly. 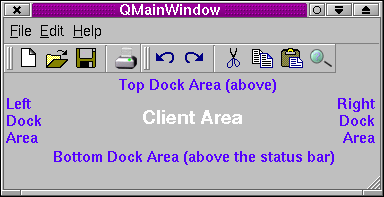 Although QMainWindow contains support for its own dock areas it isn't convenient for adding new QDockAreas. If you need to create your own dock areas we suggest that you create a subclass of QWidget and add your QDockAreas to your subclass. Lines. QDockArea uses the concept of lines. A line is a horizontal region which may contain dock windows side-by-side. A dock area may have room for more than one line. When dock windows are docked into a dock area they are usually added at the right hand side of the top-most line that has room (unless manually placed by the user). When users move dock windows they may leave empty lines or gaps in non-empty lines. Dock windows can be lined up to minimize wasted space using the lineUp() function. The QDockArea class maintains a position list of all its child dock windows. Dock windows are added to a dock area from position 0 onwards. Dock windows are laid out sequentially in position order from left to right, and in the case of multiple lines of dock windows, from top to bottom. If a dock window is floated it still retains its position since this is where the window will return if the user double clicks its caption. A dock window's position can be determined with hasDockWindow(). The position can be changed with moveDockWindow(). To dock or undock a dock window use QDockWindow::dock() and QDockWindow::undock() respectively. If you want to control which dock windows can dock in a dock area use setAcceptDockWindow(). To see if a dock area contains a particular dock window use hasDockWindow(); to see how many dock windows a dock area contains use count(). See also Main Window and Related Classes. QDockArea::Normal - The splitter handles of dock windows are placed at the right or bottom. QDockArea::Reverse - The splitter handles of dock windows are placed at the left or top. Constructs a QDockArea with orientation o, HandlePosition h, parent parent and called name. Returns the number of dock windows in the dock area. See the "count" property for details. Returns where the dock window splitter handle is placed in the dock area. See the "handlePosition" property for details. Returns TRUE if the dock area is empty; otherwise returns FALSE. See the "empty" property for details. Moves the QDockWindow w within the dock area. If w is not already docked in this area, w is docked first. If index is -1 or larger than the number of docked widgets, w is appended at the end, otherwise it is inserted at the position index. This function is used internally by QDockWindow. You shouldn't need to call it yourself. Returns the dock area's orientation. See the "orientation" property for details. You should never need to call this function yourself. Use QDockWindow::dock() and QDockWindow::undock() instead. Get this property's value with isEmpty(). Get this property's value with handlePosition(). Get this property's value with orientation().